Collaborative Partnership on Sustainable Wildlife Management (CPW) is a voluntary partnership of 14 international organizations with substantive mandates and programmes to promote the sustainable use and conservation of wildlife resources. The CPW, established in March 2013 in Bangkok, Thailand, provides a platform for addressing wildlife management issues that require national and supra-national responses and also works to promote and increase cooperation and coordination on sustainable wildlife management issues among its members and partners. 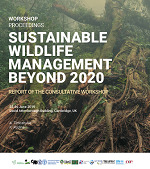 What is Sustainable Wildlife Management? Sustainable wildlife management (SWM) involves the sound management of wildlife species in order to sustain their populations and habitat over time, taking account of the socioeconomic needs of human populations. To achieve this, landusers within wildlife habitat must be mindful of the impact of their activities on wildlife resources and habitat, and on other user groups. In view of its ecological, social and economic value, wildlife is an important renewable natural resource, with significance across such activities as rural development, land-use planning, food supply, tourism, scientific research and cultural heritage. When sustainably managed, wildlife can provide continuous nutrition and income, and make a considerable contribution to the alleviation of poverty as well as to safeguarding human and environmental health. The mission of the CPW is to promote conservation through the sustainable management of terrestrial vertebrate wildlife in all biomes and geographic areas, and to increase cooperation and coordination on sustainable wildlife management issues among its members and partners. Wildlife, Food Security and Livelihoods: Provision of knowledge and support for members and countries to address bushmeat and other issues related to wildlife, food security and sustainable livelihoods. Human-Wildlife Conflict: Improved understanding of the direct and underlying causes of such conflicts in the different regions of the world; dissemination of successful response mechanisms. Illegal/Unsustainable Hunting: Support development of strategies, policies, and management systems that contribute to legal and sustainable hunting; support for appropriate efforts to combat poaching and other forms of illegal hunting. Partnership Coordination and Outreach: Establishment and consolidation of the CPW; building understanding, conveying common messages on issues of global relevance related to sustainable wildlife management.